NOTE: Students with the current rank of White Belt Green Stripe that complete all promotion requirements will earn the White Belt Blue Stripe. These students will become official Red Dragons and are eligible to purchase Red Pants. 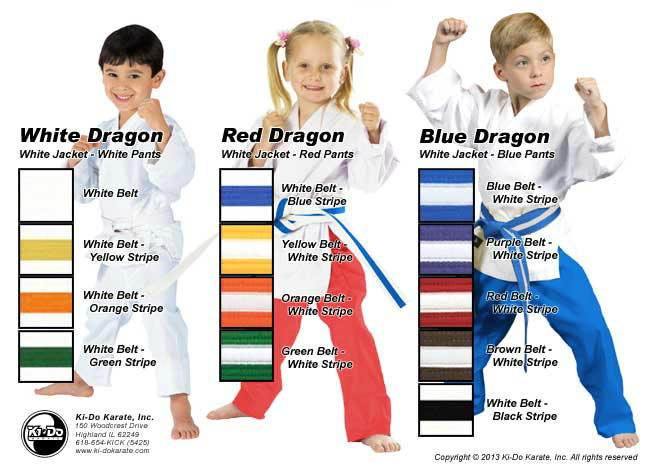 Green Belt White Stripe students that complete all promotion requirements will earn the Blue Belt White Stripe. These students will become official Blue Dragons and are eligible to purchase Blue Pants. Brown Belt White Stripe students that complete all promotion requirements will earn the White Belt Black Stripe. These students will become official Jr. Black Belts. They should purchase equipment for Jr. Black Belt Phase I.